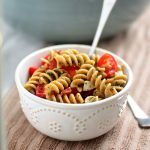 This easy pasta salad is the perfect summertime recipe – a great side dish for your next potluck! Homemade kale pesto, some crispy prosciutto, fresh mozzarella and juicy tomatoes make for a simple pasta salad recipe that’s sure to be a hit. I am seriously into this pasta salad. So much so that I actually ate the leftovers for breakfast this morning. Side note: why don’t more people eat pasta for breakfast? I think it should be a thing. Anywho, I know that a caprese pasta salad isn’t exactly GROUNDBREAKING, because every food blogger since the beginning of food blogger TIME has made about a million variations of caprese everything. Salads! Pizza! Hot Pasta! Pasta Salads! Crostini! It’s all been done. But I think there’s a reason we all keep coming back to the good ol’ combo of basil, tomatoes, and mozzarella, and that is this: IT. IS. DELICIOUS. And why fix it if it ain’t broken? CAPRESE EVERYTHING, I SAY! That being said, I did TRY to mix it up a little bit. This pasta salad gets a bitter (read: delicious) kick from a kale and basil pesto (my new favorite thing out of all of the things ever) and a bit of crispy prosciutto gives the whole thing a nice crunch and pop of salty goodness. 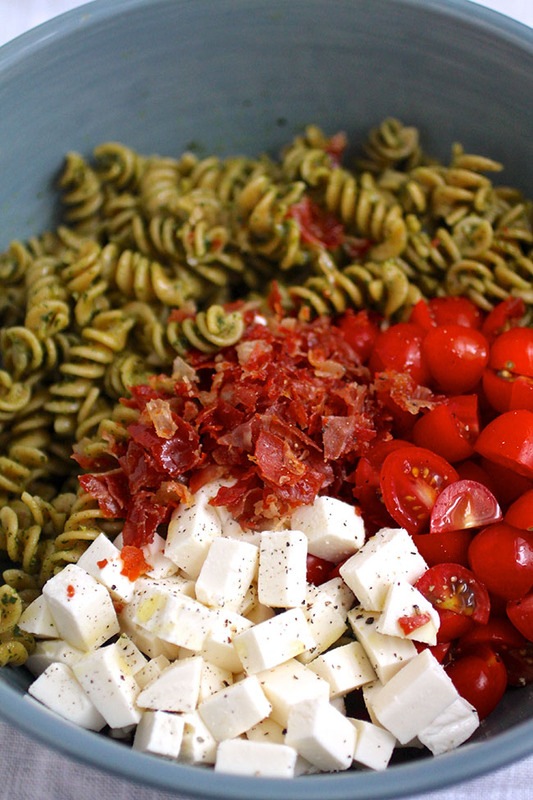 The recipe below makes a little more pesto than you need for this pasta salad, which is perfect because it means you’ll have some left over to experiment with! 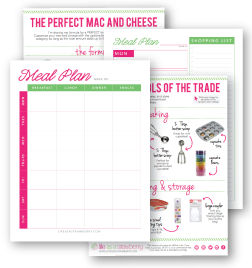 Pesto freezes really well, so I love keeping a stash in my freezer to pull out anytime I want. My stash is quickly depleting, though, because I’ve been putting this pesto on EVERYTHING lately. So far, it’s amazing in scrambled eggs, mac and cheese, and on pizza. And I still have enough left to make this pasta salad again tomorrow! WIN. 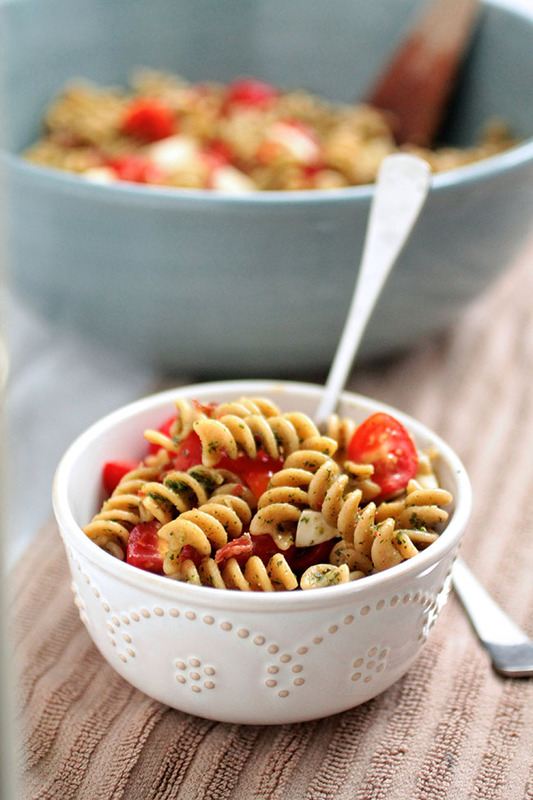 This easy and summery pasta salad features classic caprese flavors with a twist. Toast pine nuts in a small skillet over medium heat until lightly browned. Set aside to cool. Place cooled pine nuts, basil, kale, garlic, salt, pepper, and parmesan in a food processor and pulse once or twice to combine. Stream a few tablespoons of olive oil into pesto while food processor is running, until you’ve reached the desired consistency. You may not need all of the olive oil – I generally use between 1/2 and 2/3 cup to get it to the right thickness. Cook pasta in very salty water until al dente. 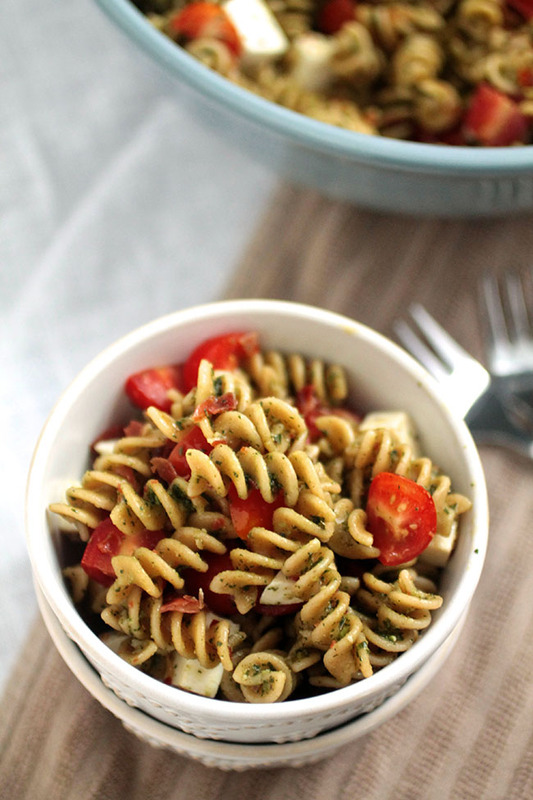 Drain pasta and toss with pesto. Set aside to cool. When pasta has cooled to room temperature, toss with tomatoes, mozzarella, salt, and pepper. Place in a covered container in the fridge to chill for at least an hour or until you’re ready to serve. Just before you’re ready to serve, place the prosciutto on a baking sheet (I like to use my nonstick baking mat so the prosciutto comes up easily). Bake at 400 degrees for 5-7 minutes or until prosciutto is nice and crispy. Prosciutto tends to crisp up pretty quickly, so keep an eye on it. Let the crispy prosciutto cool to room temperature and slice it as best you can – it will crumble a bit, but that’s ok! When you’re ready to serve, toss the crispy prosciutto pieces with the rest of the pasta salad. 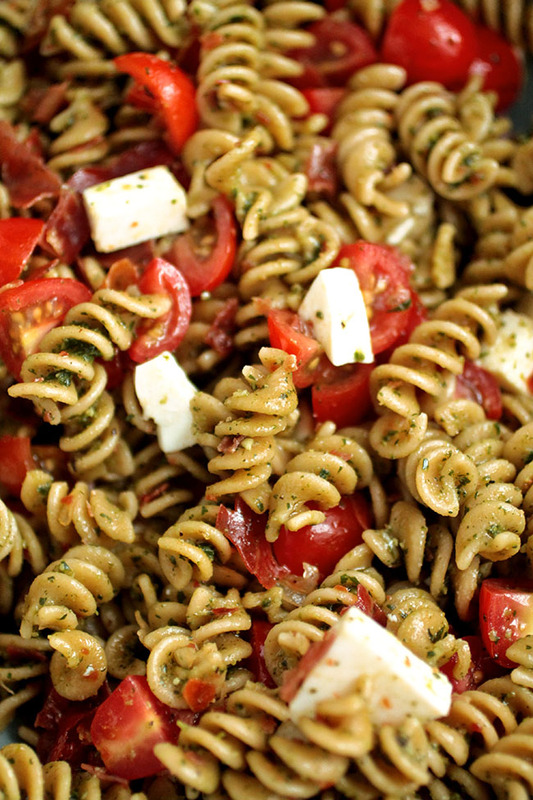 If the pasta salad is a little dry, toss it with some more pesto or a drizzle of olive oil. Serve immediately. I love the bitterness that fresh kale lends the pesto, but to tone it down a bit just blanch the kale before adding it to the pesto to take some of the bite out of it. Wait to add the prosciutto until you’re ready to serve so that it doesn’t get soggy. 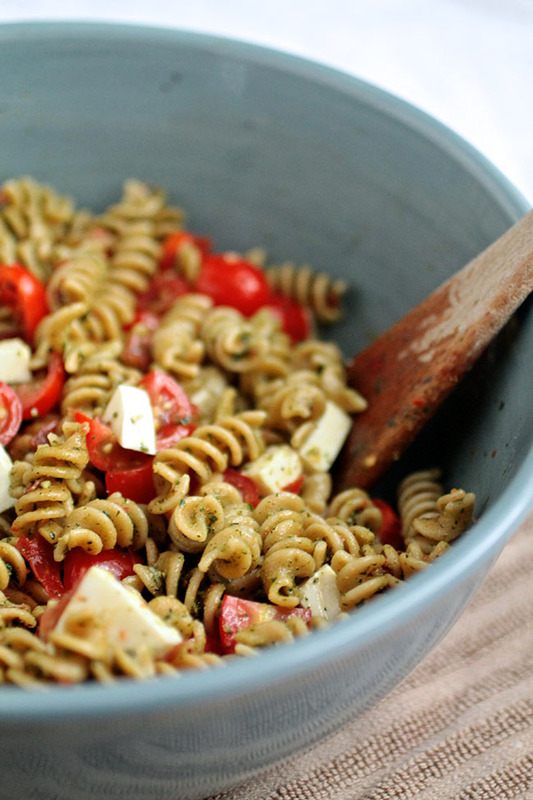 Very yummy caprese pasta salad. Made this many times and it’s always enjoyed. I’m happy to hear that! Thanks for letting me know how it turned out. Ummm I did the same thing last week! We had tons of pasta salad left over, and I seriously at it before work one day. I’d do the same with this, looks so good! I’m glad I’m not the only one! Thanks! SO delicious! I’m glad I’m not the only one on the caprese train 🙂 Let me know how you like the pesto if you give it a try – I’ve been putting it on EVERYTHING lately.